The rat base from Hero Forge fit my punk turtle concept really well, even if in the end he looks a little akin to Bebop or Rocksteady. Ah well. I didn't go into too much detail on the rats. Mostly used a larger brush to blend a dark base brown or grey into white. Only real technique on these was allowing brush strokes to be visible and trying to paint in directions their fur might be flowing. Painting the base coat - As with his other plated parts I put orange in the recesses to start. Then, I outlined each scute (the technical term for each plate in a turtle's shell.) in a dark green, followed by lining around that with a light green and another dark green spot in the middle of the scute. 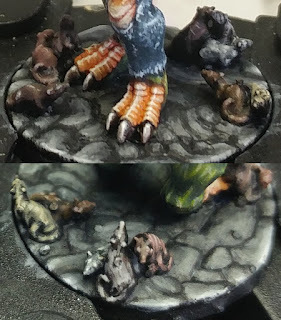 The next step was to clean up the messiness of the base coat by outlining the outside of each scute with highlights on the upper edges. Followed by dark green shadows on the lower edges. In the final photo I actually have applied a very light wash of a chamo green mixed with flow aid as a thinner. Lower Left - Bright green on the lower half, light green highlight on the upper half. Upper Right - Same thing, just from a different and more blurred angle apparently. Lower Right - Apologies for the Step 1: Paint, Step 2: ?? ?, Step 3: Finished! approach. - Basically I brightened up the green base and added more highlight. - I think I ended up using a darker green to emphasise the division between the liquid and the highlighted rest of the bottle. 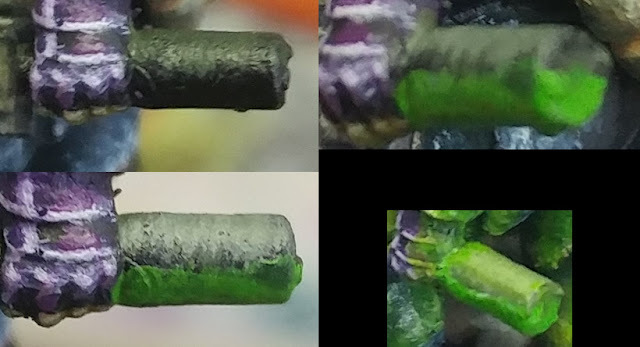 - Then I applied a bunch of layers of the green, thinned with water into a thick wash, to create the OSL effect on the model AND the bottle. (this also blended the highlight and the liquid together.) 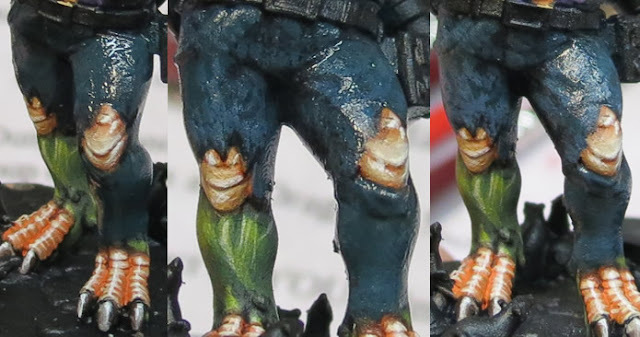 That OSL wash is what ends up applied to the stones on the ground, rats, the legs, turtle shell and a few other places. Nothing fancy, but I think it turned out pretty good. The rims were just dark metal with a silver highlight. The bottle itself was grey highlighted into white. The upper rim was based the same as the other metal rims but with a thick purple self-made wash to allow some of the metallic to show through. This is the part I'm REALLY happy to share because I think the jeans turned out fantastic. As a first layer, I painted a deep blue using Curry's flow aid to keep it wet. I then mixed a little lighter blue in the dark blue and kind of blotched it on randomly. I still focused on the areas that highlights would reach. In the third photo below I did the same thing just with the blue paint even lighter. The next couple steps add the jean texture we're all familiar with. Now, I used a rough brush (pictured below) because the irregular bristles were great for dabbing the highlights on to the material with. I also didn't work the tip of the brush into a point as I'd usually do too. Basically, after getting paint on the tip of that brush, I dotted a little onto my paper towel (Like how you'd get paint off the brush when drybrushing but with a dabbing motion instead of wiping.) then tapped and dabbed the tip of the brush in random ways and angles across the surface of the pants. It's time consuming and you still want to focus on the highlight areas, but the effect is pretty solid. In the final step I focused a little more on the edges of creases and the pants / holes. I still used the rough brush for this, but you might find it easier with a cleaner point. Here are the same steps as above but applied to the back of his pants / pants pocket. 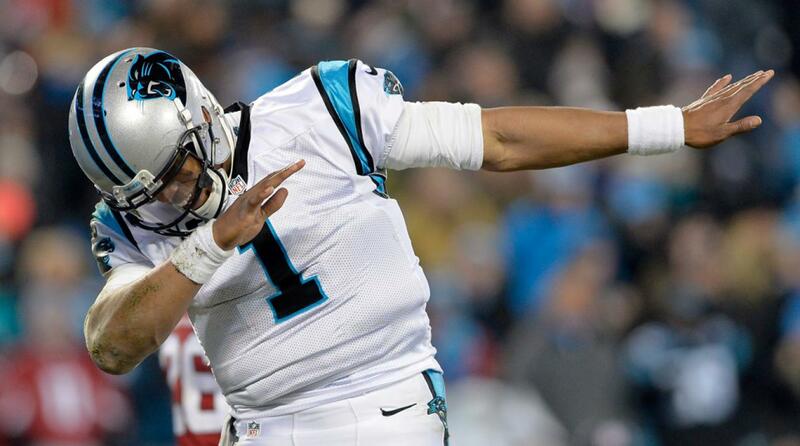 There we have it! Overall, an aesthetic that really speaks to me, kind of reminds me of the Age of Sigmar Knight I painted a while back, though I didn't intend for the highlights to be so bright. I think I created a good balance though and instead of everything hitting the bright highlight, it's more central around his jacket and jeans while the rest of the mini eases off. 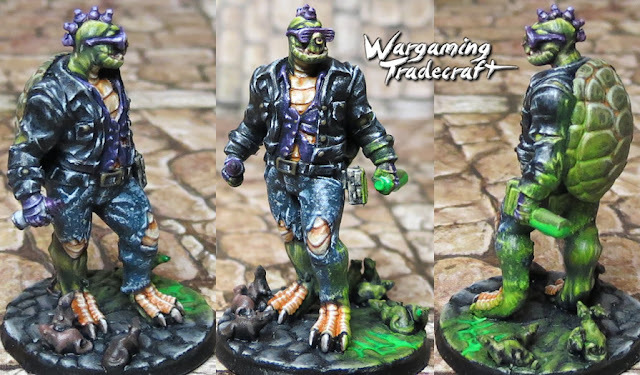 All in all, it was a great review to write and it was nice to just paint a mini to be creative from start to finish.